Take a short 5-minute survey for free access to this on-demand webinar. When B2B buyers consider new vendors, what criteria are most important to them from an overall company perspective? Reputation? Industry experience? Service and support? 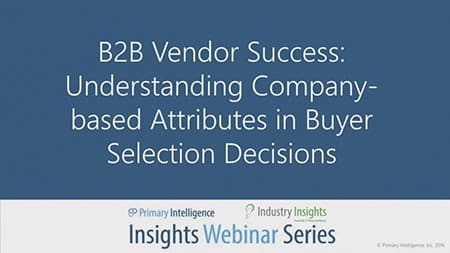 Watch this 15-minute “power” webinar to hear the latest research on company-related attributes most important to B2B buyers.